We're not tourists... That's what I'm talking about. And it should have been 4-0 or more. My uncle, who has never traveled outside Ghana in his life let alone been aboard a plane, managed to get a visa and ticket to attend the World Cup with the rest of the family. When he showed up at the airport for his long trip to Frankfurt, he was dressed in white from head to toe. I know exactly what he meant. [Update 2 hours later] : My family have somehow made it to the party at the team hotel. Pandemonium is the only word to describe what is going on there. I could barely hear them over the sounds of jubilation. I can't even imagine what the streets of Ghana are looking and sounding like. We are mindful of previous premature celebrations but for now it is only elation. It was my cousin's wedding yesterday back in Ghana. For some reason, the ceremony had been scheduled at a time, 4:30pm, that overlapped somewhat with the match. I'm assuming that things were set in place months ago, hence I'll reserve comment about foresight and the like. In any case, she and her groom were standing at the altar and the Reverend was delivering her encomium (in addition to her pastoral duties, the priest was a senior member of the Ghana Educational Service). All of a sudden there was a shout from the congregation. A text message had undoubtedly been delivered: Ghana had scored a goal. I believe it was the second goal, the one that put the result beyond any doubt; most of the guests had watched the great start of the match and had been in good spirits, if a little nervous, throughout the ceremony. Hallelujahs then poured forth from the church seats and the Reverend began pronouncing all kinds of glories from the altar. There was singing and dancing in the aisles, alarming my father and uncle who are of the more sedate school of establishment propriety. With the priest's encouragement the congregation then went into joyous hymns. As my dad put it "they actually proceeded to sing two full choruses". My dad refused to clarify what praise song it was that was sung, or indeed whether the couple joined in, but you can imagine the commotion. After that celebratory interlude, the ceremony resumed and the couple was duly and quite properly married. As they left the church, the match had ended and the big party that Ghana embarked on last night began. I can't wait to see the video footage of their wedding, these ceremonies are so important in our traditions and we strive to bear witness even if football intrudes. Still, I now know that part of my wedding gift to them will be the DVD of the match that they missed but lived through. I'm told the ensuing reception was wonderful. It turns out that my mother has returned to her journalistic roots for the month at hand, and has been writing up her experiences as a Ghanaian fan attending the World Cup for the Ghanaian Times. The first of her dispatches has been posted online and the ones about the Czech game should be up shortly at the Times website. You can get a taste of the original toli monger with her World Cup Diary and see where I get my lines from. "GHANA", we shouted, "ITALIA" they shouted back, they were the most good humoured group of fans you had ever met. There was a determined Swede who appeared intent on making me strip so he could have my top. Fortunately for everybody and the horses that might have been frightened, I am no longer that brave, so I only gave away bandanas. It is the Czechs who are asking the most questions. Losing to Ghana had not been on their agenda, but now that they have lost, they are very keen to know who we are, and so are their friends. 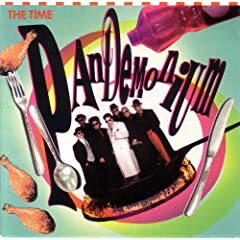 The first track of The Time's great 1990 album Pandemonium is called Dreamland and that is where some 20 million Ghanaians are living right now. The soulful and funky "Minneapolis Sound" wrought by the Purple One, Jam and Lewis, Morris Day, Jerome Benton and Jellybean Johnson sharply suits our purposes here. As the former Gold Coast, we are quite partial to things that glitter, thus it is fitting that the Black Stars can rest tonight with a ballad titled Donald Trump (Black Version) . Ghana's greatest export being cocoa, it goes without saying that the first side ends with the aptly-titled Chocolate . 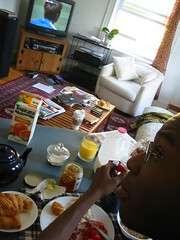 I'll conclude with a look at how breakfast is served during the World Cup. There's been a slight adjustment to my previous setup after some suggestions from toli readers. A card table was manufactured from the basement and moved to the living room allowing hunger to be assuaged, a more comfortable desk arrangement for any computer activity, the use of my comfy office chair, and most importantly, satisfactory world cup viewing. The Wife seems strangely supportive of this business, bless her. That was an awesome game! Go Ghana! I am soo happy! Can you tell me why the player for your lads waved the Israeli flag at the end of the game? Excellent game to watch and result by the way. I am sooo excited about this win. Was screaming my head off. Glad your uncle got to go!! I was thinking of you during that game! Ghana really dominated. Let's see if US can do something later today! Great game, the most interesting game I've seen so far, hopefully Ghana can move on to the next round! And the celebrations were crazy. Sadly I left my camera at home. On thursday though, I'll be carrying it with me to work to get pictures of people dressed up for the US game. Hi! Ghana - Italy 2:0! Congratulations! Please, add my soccer world cup blog against racism to your blogroll! Rumsfield's known and unknowns are something similar to 'Politics within the politics' as they say here?